Not bad. Not great. Pretty average. Your enjoyment may vary depending on your age, when you see/seen this, and your tolerance for older anime. This OVA has absolutely no continuity, so you can literally watch the episodes in any order and it won't matter. You may or may not like this aspect; I personally prefer a strong central plot. There was nothing inherently wrong with the stories told here. After each one I would want to see another, not because they were particularly good, but I think more so because each one left me feeling perpetually unfulfilled. The stories are just little adventures that never really add up to anything. So they're mildly entertaining in of themselves, but always left me wanting. Also, most of the fights are cartoon army style where thousands of shots fly by, or the enemies can be shooting at almost point blank, and everything but the target gets hit. Same as the story, or maybe because of it, nothing really develops here either. The characters are neither particularly annoying, nor particularly memorable. Everyone but the main two characters are practically cameos. Even then you still only get a vague idea of the main characters personalities. The art was fine, I suppose. Nothing that stood out but pretty standard for the period, I believe. I listened to about an episode and a half of the dubbing, and that was enough for me to conclude that this was some of the least enthusiastic voice acting I've heard. Neither the themes nor background music stood out to me. Enjoyment: For me this was an ok series about 2 female agents and it was just ok nothing much to hang out or much over the top. But all in all i think it is up to each viewer and what he or she likes (that is most likely in all series i guess so). Art: The art was typical 80' - 90's art style if you looking for fine arts it is not for you but if you like some old school action with a little poor but ok arts i think you would like it. Characters: The 2 female agents the series are based on you can like them pretty well but you don't get much back story around them so you got to like them for what they do in each episode i guess. For me they was ok and good enough. Story: As for the story it's not bad but not that good either couse what i mentioned earlyeryou don't get to much story it is episodes with a new adventure each time and that is ok with me. You get a good load of action each time so. And we can say that this is i think for the younger audience, not any blood or bad language. 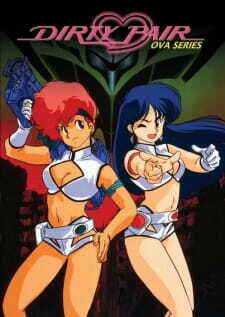 I saw it was some longer series about Dirty Pair so maybe you get some more story there i don't know. So all in all you get the action you maybe want to see, not very adult content so very good for the children. I think that most children would love it. They call themselfs kei and Yuri or ´Lovely angels´, criminals call them´Dirty Pair `One of the best and funniest ova´s from the 80´s, a time that gave the birth of OVA´S. Seeing it for the 1st time back in 1998 i had nice time watching this on vhs, and those 2 ladies.... big guns and EVERYTHING ends with destruction, no matter how easy an job it is and the department they work for just keeping the bills pilled up at the desk.